Scientists have successfully conducted the first high-volume collection of plankton, including animal larvae, from the deep ocean using a new sampling device mounted on a robotic submarine. Scientists and engineers from Duke University, the University of Oregon and Woods Hole Oceanographic Institution (WHOI) deployed the new sampler — nicknamed PlankZooka for its uncanny resemblance to two bazooka rocket launchers — on July 9 during a research expedition aboard the RV Atlantis off the U.S. East Coast. Unlike sampling devices used in the past, which often damaged the delicate planktonic specimens they collected, the new SentrY Precision Robotic Impeller Driven (SyPRID) sampler uses spinning blades inside tubes to gently pump large volumes of water, and the microscopic organisms it contains, through a net system housed within two carbon fiber composite tubes. Funding for the expedition and for the development of Sentry and the SyPRID Sampler comes from the National Science Foundation. “Part of the beauty of its design is that planktonic organisms are filtered gently so they remain intact for scientific analysis,” said Cindy Van Dover, director of the Duke University Marine Laboratory. On its maiden voyage, the SyPRID sampler was carried by the autonomous underwater vehicle (AUV) Sentry to a depth of more than 2,150 meters — where pressures exceed a bone-crushing 3150 psi — and drove a precise sampling pattern for more than eight hours just above a natural methane seep. Thirty-nine deep-sea larvae, representing 16 different types of animals, were collected during the eight-hour survey. Genetic and morphological analyses will be conducted on the preserved specimens after the expedition returns to shore. Natural methane seeps play an important but poorly understood role in the ocean ecosystem. The organisms that depend on methane from the seeps play a substantial role not only in the marine food web but also in altering the quantity of methane released to the ocean surface and, potentially, in the overall chemistry of the ocean. Scientists lack a clear understanding of how sedentary or slow-moving animals move between the widely separated seeps, how new seeps are populated, and how resilient these ecosystems may be in the face of ocean change. Studying the microscopic planktonic larval stages of these animals may shed light on many of these processes. Previous net-based sampling tools limited researchers’ ability to study deep-sea larval distributions because the samplers were not able to get closer than 50 meters to the sea bottom and could only move over long distances towed at an angle from the surface, noted Carl Kaiser, AUV program manager at the WHOI National Deep Submergence Facility, which owns and operates Sentry. 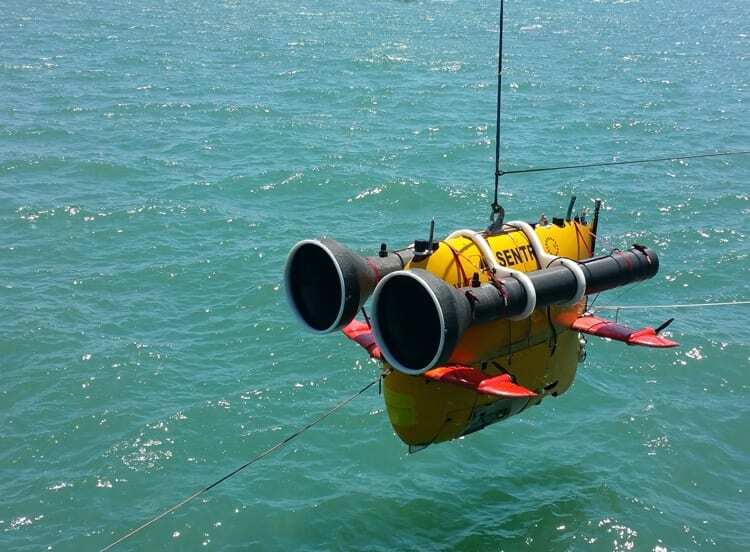 “By contrast, Sentry is capable of delivering the new sampling device to within two to three meters of the bottom, or any other desired depth, and within five meters of any desired point or pattern of points in more than 95 percent of the world’s oceans,” Kaiser said. Van Dover, Kaiser and Young jointly developed the concept for an AUV-deployed precision sampler which was then designed and built by engineers at WHOI led by Kaiser and Andrew Billings. The research expedition, which seeks to understand the genetic, oceanographic and larval connections among seep ecosystems in the Atlantic, also includes scientists from North Carolina State University. The methane seep the SyPRID sampler explored was identified by Van Dover on a previous expedition. Laurel Hiebert of OIMB led the on-board team responsible for sorting and preserving the collected larvae. Svetlana Maslakova co-leads the OIMB team with Young.